Been wondering how would one get the combined rules of starting a town with the strictness of an Apocalypse. 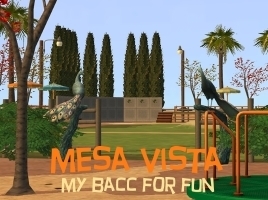 For me the BACC is a little too easy with all the expansions lol, or the player has to dedicate what needs to be build. While and Apocalypse would literally be where the community wants to come from troubled times (yes I may have storylines for all lol). The trick is the reverse Career rules. BACC need to build up to unlock careers, while Apocalypse is going through careers to unlock uses of items again. These are all great ideas! Another thing depends on which bacc ruleset you go with. There is also that apocalypse mod that restricts things for you. I'm actually doing something sssssort of like this- or maybe it's more like an Apocalypse-smushed-into-a-Prosperity. So for example: Let's say we have three households: We'll call 'em the Allen Household, Beck Household, and Crane Household. Zachery Allen, of the Allen Household, becomes a World Class Ballet Dancer, topping the Dance career and lifting the restriction for his household. As long as Zachary remains a World Class Ballet Dancer, the Beck and Crane households can also enjoy the benefits of the lifted Dance restrictions. Buuuut if Zachary dies/loses his job/quits his job/retires, then the restrictions go back in place for the Beck and Crane households. However, it still counts as lifted while you're playing the Allen Household. I'm still experimenting with this so my main observations are that 1) It seems to be an easier take on the Apocalypse challenge, but 2) It does mean you have a bit more to keep track of. Science is possible too, maxed logic if you spent your time playing chess is feasible at least. Medical on the other hand, which requires 1000 population by the original BaCC , seems a bit too late... perhaps at least 3-5 sick people would already be enough here..
Culinary with its level 5 restaurant by the original BaCC would again be impossible with the Business restriction, but maxed cooking skill could work too, however everyone taking culinary should have it maxed until alevel 5 restaurant opens. The Business restriction finally could be opened by founding enough new households to place enough unowned commnity lots ~ 5 lots = 20 households? To avoid overuse of Business Districts and Unis later, I'd actually use my old idea, that you these counts towards the population only once (3 unis = still only Sm +5), while certain requirements (e.g so and so many in a career) lifted will eventually get you specific landmarks/buildings, that add 5 to the Sim-multiplicator , so if we'd get 40+ together, that allows an SM high enough to get 50000 population. I would like playing a challenge based on your scribbles - the buildings/businesses based on the jobs within the careers is a great idea! Although for me, instead of trying to blend the two official challenges and their respective scoring and restrictions, I would use it more as the theme for a "Post-Apocalypse Rebuild" challenge with the aforementioned items as goals to meet, and see then how your city turns out upon completion, based on your choices. Lorinsv wrote: I would like playing a challenge based on your scribbles - the buildings/businesses based on the jobs within the careers is a great idea! 3.) restriction for City - again, to get rid of the BaCC's need to place an insane amount of Business districts and universities, I propose Landmarks counting towards the SM, while Districts and Unis only count one time... landmarks can already be the above community lots that restrict taking a career. Happy Easter (or another Happy Holiday or just a Happy Day, if you read this later)!